X-Men Blue #36 review – AiPT! 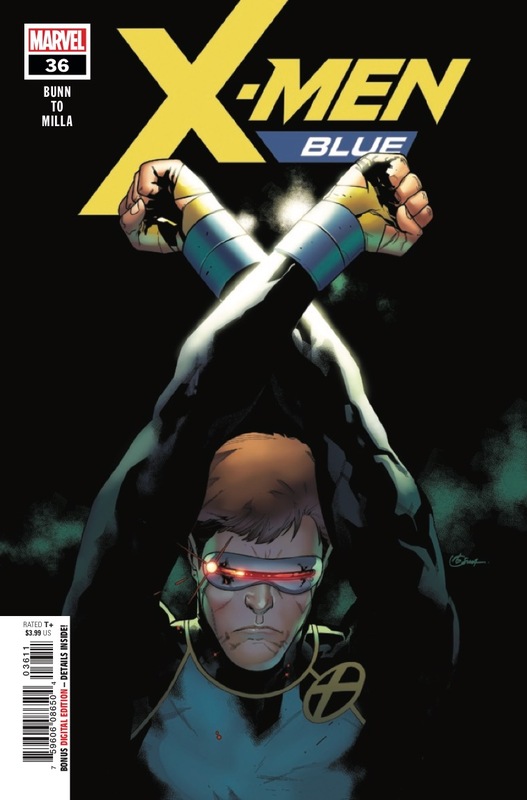 The X-Men Blue squad–and writer Cullen Bunn–tie up a few loose ends in this series’ final issue. Well, X-Fans, it’s the end of yet another X-Men era (one I was particularly fond of). With X-Men Blue #36, the curtain closes not just on the time-displaced original five’s latest series, but writer Cullen Bunn’s time with the X-Men… for now (you never know, just look at Chris Claremont!). Since X-Men Blue’s launch in April 2017, two times every month, this classic-yet-fresh series consistently sat at the top of my Wednesday reading stack. As a result, I went into its final issue as if I was starting my last day of high school or a job at which I’d made great friends–no matter how much I enjoy it, I know it’ll be over in a blink of an eye. It should come as no surprise to fans of this series that Bunn’s final X-Men Blue adventure is as strong as the final few issues that came before it. While the writer has collaborated with several talented artists throughout his run, this series’ strong finish owes a great deal of its success to penciler Marcus To. There are some very nice splash pages here that can easily become your new favorite computer wallpaper, from the fun to the romantic to the triumphant final page (guess which one features the X-Babies). Ultimately, this final issue does everything you’d hope the last X-Men Blue story (which isn’t actually the last story featuring this cast) would do. It ties up many of the dangling plot lines generated by a master long-game planner over the course of 36 issues. Bunn has contributed so much to the X-Men mythos since ResurreXion that I’d completely forgotten about one or two of the characters who pop up for a page or two. While we do jump around a lot–as you’d expect from a team living on borrowed time–there are some excellent character-focused scenes sprinkled throughout. I think Cyclops fans (hey, that’s me!) benefit the most as Scott Summers is central to emotional scenes involving his father Corsair and his future wife Jean Grey. Yes… Bunn finally addresses the state of Scott and Jean’s relationship. No worries, only took 36 issues! And… do I spy an homage to one of X-Men #30’s most memorable scenes? If this story has any flaws, it’s probably the fact that while Scott, Jean and Hank all get a moment of closure, Warren and Bobby don’t really receive the same treatment. To a degree, the two often served as comic relief in X-Men Blue, so it’s not entirely surprising. Still, I feel like those who enjoyed Bunn’s takes on these characters may be a bit bummed by issue’s end. Still, there are only so many pages in this comic and these two did get plenty of time to shine last issue, so again, it’s not a huge flaw. At the end of this issue, everything kind of comes full circle, which reflects the circular nature of mainstream superhero comics and modern runs. Like Brian Michael Bendis and Dennis Hopeless before him, Bunn’s time with the original five is over, and it looks as though they’re heading home for good in Ed Brisson and Pepe Larraz’s terrific Extermination. There’s no better way to sum up X-Men Blue. Bunn, To and the series’ other artists have made so many wonderful contributions to Scott, Jean, Warren, Hank and Bobby’s personalities. Their adult counterparts may not suddenly remember these new memories, but we–the fans–will never forget. We’ll never forget that Jean and Magneto developed a relationship almost as complex as the one shared between the master of magnetism and Professor Charles Xavier. We’ll never forget that time a vampire version of Storm from an alternate reality came between Scott and Jean. We’ll never forget when Jean asked the Raksha to teach the X-Men how to be ninjas. And we’ll never forget the time Stan Lee and Jack Kirby’s original X-Men had the guts to kidnap the ’90s’ most notorious cover model Venom and dragged him to space. So many out-there ideas mixed with just enough soap opera drama and classic comic book fun to make for a truly unforgettable run. Thank you, Cullen, Marcus and everybody else on the X-Men Blue team for the past 36 issues (and one annual, of course). I survived the experience, but I can’t help but feel a bit… blue. X-Men Blue #36 is a bittersweet but triumphant finish to Cullen Bunn's excellent run. Cullen Bunn wraps up several dangling plot lines on a satisfying note. Marcus To leaves his mark on the X-Men mythos through one amazing splash page after another. A strong finish to a series that pushed the X-Men in exciting new directions while never losing sight of what made them great. Angel and Iceman don't get as much attention as Cyclops, Marvel Girl and Beast.